Now that Parks and Recreation has ended, Aziz Ansari has set his sights on a much bigger gig. The actor and comedian recently put together a large stand-up special in Madison Square Garden. If you weren’t one of the thousands of people able to attend, have no fear, we’ve got a first look at the comedy special, below. Like many comedians, Aziz Ansari’s comedy comes from real life. He’s a fun mix of goofy swagger and stories with a ring of truth and poignancy to them. In the clip, he talks about growing up with immigrant parents, and it’s incredibly cool how he can get across love and respect for his parents and their sacrifices while cracking enough jokes to keep the audience rolling in their seats. I already miss Parks & Rec’s obnoxious Tom, but this sketch is enough to get me excited about Ansari’s stand-up. If you like what you see here, you won’t have too much longer to wait. Aziz Ansari: Live at Madison Square Garden is actually hitting the subscription streaming service on March 6, which means fans will have less than 24 hours before they can catch the comedy special, which was filmed in front of a sold-out live audience. The Madison Square Garden stage venue is huge and Netflix tries to give us a sense of its grandiosity in the poster for the special, below. Aziz Ansari: Live at Madison Square Garden is probably the biggest stand-up special the comedian has attempted, but it isn’t his first stab at comedy on Netflix. In the past, Netflix has also been the distributor of other Ansari comedy specials, including Buried Alive. In addition, Ansari’s Intimate Moments for a Sensual Evening and Dangerously Delicious are also available on Netflix. Aziz Ansari isn’t the only Parks and Rec cast member to have put together a stand-up special for Netflix. Nick Offerman’s hilarious special Nick Offerman: American Ham hit the schedule in December. That special ripped on pop culture and more, including a hilarious bit poking fun at Carrie Underwood’s “Jesus Take The Wheel.” Now, give me a Retta Netflix special and I can die a happy woman. In addition to the Netflix special, you can also catch up on the last few episodes of Parks and Rec. NBC currently has the seventh and final season of the series available over at its website. 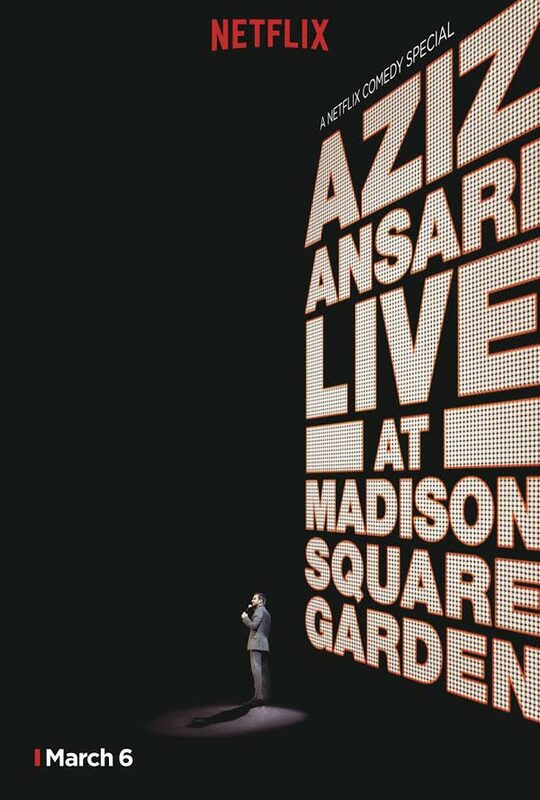 The twelve episodes should be enough to distract you while you wait for Aziz Ansari: Live at Madison Square Garden to drop after midnight tonight.